A small family run Teriyaki place – aren’t they all – just around the corner from Wibley’s. Nothing about this place screams out awesome or shocks you. It’s an average Teriyaki place serving the meals you would expect at reasonable prices. For those of you not familiar with Teriyaki joints you can expect Chicken/Beef/Whatever Teriyaki, Katsu (breaded and deep fried meat), Tempura (battered and deep fried), yakisoba (a stir fried noodle dish) with rice and a side of vegetables or salad. Taste: 3/5 – Nothing special just you’re average Teriyaki joint. Price: 4/5 – It’s a fair price around $7 a meal. Quantity: Just Right – There won’t be food left over for doggy bags but you won’t leave hungry. Wait Time: 5 minutes – Straight in, the place isn’t as busy as Sapporo’s so you should get a seat pretty easy. Parking: Easy – You won’t have trouble finding spaces nearby. Don’t Miss: Help yourself to soup free with every meal. 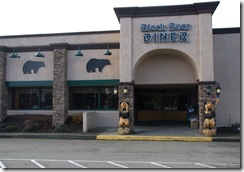 Upon entering Black Bear Diner, you may feel as though you’ve been transported out of the software developer cultural epicenter that is Redmond and straight into small town American West. 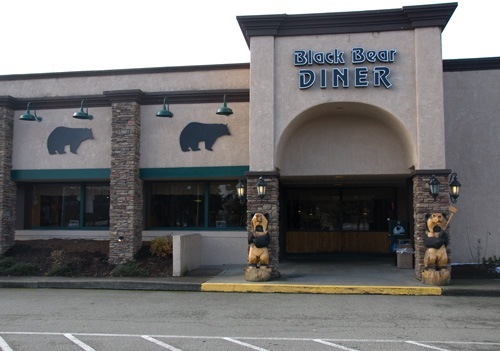 A chain started in Mt Shasta, California, the Redmond location certainly exudes the National Park family restaurant vibe. Surprisingly given its proximity, it doesn’t seem to be frequented by many Microsoft employees, but rather a selection of the plaid button down shirt types. Taste: 3/5 – Typical American restaurant food with burgers, sandwiches, salads and breakfast served all day. Many of the entrees have a California twist, often by incorporating avocado in some way. Most of us opted for the breakfast options and were not disappointed. Price: 4/5 – Undiscounted prices are what you’d expect, however recently they’ve started offering a generous 20% prime card discount. Probably a better choice for dinner; if MicroGrub weren’t specifically rating spots for lunch, we would have gone for a higher OGF. 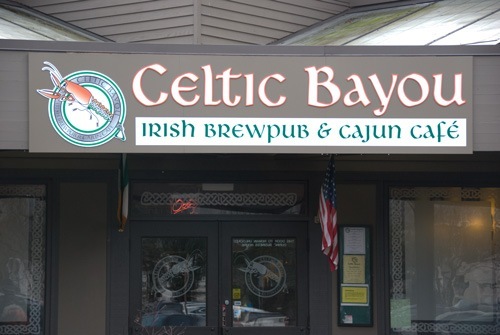 As it is, Celtic Bayou probably won’t make it into most people’s regular lunch rotation, despite its surprisingly complimentary mix of Irish, Cajun and burgers with a Pub atmosphere. 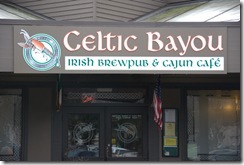 Which is a shame since it’s one of Redmond’s more unique restaurants. If you’re a trivia fan, be sure to stop by Monday nights for some friendly competition. Taste: 4/5 – It’s hard to find a dish here that’s a disappointment, with the possible exception of vegetarians, it should be easy for everyone in your group to find something they like whether it be a Cajun gumbo, an Irish stew or a surprisingly good burger. Price: 3/5 – Nothing shocking, dishes usually clock in at just over $10. Wait Time: 25 minutes – this really is the main issue preventing us from giving it a higher recommendation, CB is definitely more of a dinner and drinks place making it hard to be in and out for an hour lunch. Don’t Miss: Adding some novelty hot sauce to your Jambalaya. A local fast burger chain with decent food and good appetizers, but the burgers can’t compare to Wibbley’s. 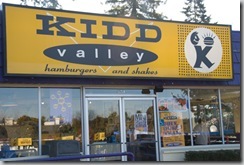 Don’t get us wrong, Kidd Valley’s still a class above national chains like Burger King, McDonald’s or Wendy’s. Service was friendly and fast, although not chain-fast, which is a good thing. 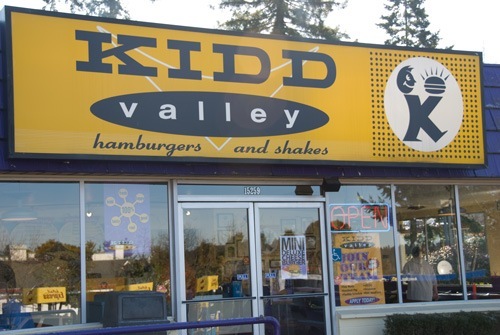 However, when compared with all the excellent burger joints that can be found in the Seattle area, it can’t really stand with the Red Mills, Blue Moons and Wibbleys (although unless you head into Seattle, you’re not going to be able to hit up the Mill or the Moon for lunch). Taste: 3/5 – A good selection of quality appetizers (we tried them all – the onion rings and sweet potato fries were our favorites). The burgers however were a bit uninspired, and even a bit cold when they arrived. Price: 3/5 – In the $5-$10 range depending on how much you order. More expensive than McDonald’s, but cheaper than most sit-down places. About what you’d expect. Quantity: Just right – menu items range in size from snack-sized mini-combos to double burgers, it should be easy to find a meal to fit your appetite. Wait Time: 10 minutes – once we ordered, the food arrived quickly, just took a while to make our way to the front of the line with only one cash register open shortly after noon. Don’t Miss: The sweet potato fries and the indestructible, milk-shake-proof straws.